The Boston Herald is being sold to GateHouse Media for $4.5 million in cash, as publisher Patrick J. Purcell is giving up his long, expensive struggle to keep Boston’s second-largest daily newspaper independent. As part of the deal, the Herald also filed for federal bankruptcy protection Friday, which would allow the company to renegotiate its debts. Purcell said GateHouse did not agree to pick up the pension liabilities of the Herald’s many unions. Purcell addressed the Herald newsroom Friday afternoon in what reporters said was an emotional speech. He said he had tried as long as possible to keep the Herald afloat and did not want to see it go out of business, according to employee accounts posted on social media. GateHouse has said it will keep 175 of the Herald’s roughly 240 employees, Purcell said. In addition to facing concern about their pensions, Herald employees will also have to interview with GateHouse in January in an attempt to keep their jobs, staffers were told. 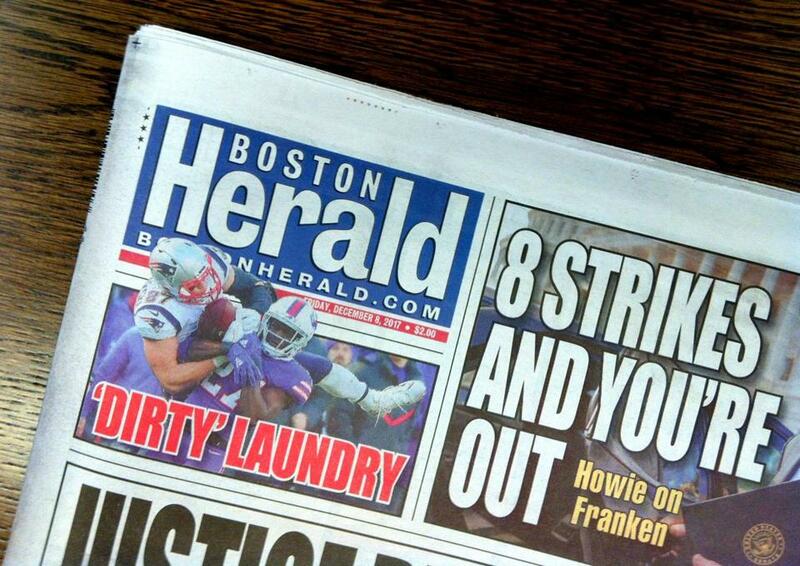 The Boston Herald is being sold to GateHouse Media, the newspaper’s publisher, Patrick J. Purcell, told employees Friday afternoon, and also filed for federal bankruptcy protection. “It’s a time of great uncertainty for us, and we’re all waiting to see what happens next,’’ said O’Ryan Johnson, a union representative for the Greater Boston Newspaper Guild at the Herald. About half the Herald’s jobs are in the newsroom, or 120 employees. The sale threatens to shake up the media landscape in Boston at a time of tremendous change convulsing the industry. Under Purcell and its previous owner, Rupert Murdoch, the Herald has been a feisty tabloid known for crime, political, and sports coverage. It is unclear if it will retain that distinct personality under GateHouse, which is known for cutting costs and centralizing operations across its vast media empire. The company owns more newspapers than any other publisher in the United States, including 130 dailies, such as the Telegram & Gazette of Worcester, The Patriot Ledger in Quincy, the Enterprise in Brockton, and the Cape Cod Times, as well as more than 640 community papers. Bankruptcy records indicate the Herald expects to lose money in its current fiscal year, on revenue of $34 million. Founded in 1846, the Herald has struggled of late with the pressures confronting media companies across the industry, with revenue from print advertising and subscriptions declining while publishers are tethered to expensive printing operations. Meanwhile, Purcell tried to expand on the digital front, including a launch of an online Herald radio station. At its peak in 2000, the Herald had 900 employees, Purcell said. Purcell bought the Herald from Murdoch in 1994, and has made many moves over the years to cut costs, including selling the Herald’s sprawling plant on Harrison Avenue, outsourcing printing to The Boston Globe, and moving to a smaller space in the Seaport District in 2013. Print circulation has been shrinking at the tabloid, falling in the third quarter this year to 45,155 on an average weekday, down from nearly 84,000 in 2011, according to the Alliance for Audited Media. Combined with digital subscriptions, the Herald has 73,510 subscribers on Sundays, according to the Alliance. Purcell put the Herald on the block in September. Nine potential buyers signed nondisclosure agreements, but only GateHouse made a bid, court documents indicate: $4.5 million in cash, plus the assumption of at least $500,000 in liabilities. The bid is conditioned upon the rejection of the Herald’s collective bargaining agreements and the modifying of pension and health care obligations, according to documents filed in bankruptcy court in Delaware. The proposed sale must be approved by the bankruptcy court, and another bidder could emerge in the proceeding. GateHouse Media chief executive Kirk Davis declined to say what will happen to the Herald’s employee pensions. He would not commit to how many employees will be retained. But Davis spoke highly of the Herald and its newsroom, and sees several ways GateHouse can benefit from owning the Herald. Davis credited Purcell for his tenacity, and noted that there are few big cities left with two daily newspapers. “He’s always made the newspaper fight above its weight,” Davis said. GateHouse is based outside Rochester, N.Y., although Davis works out of a Needham office. Its parent company is New Media Investment Group Inc., backed by Fortress Investment Group . In its bankruptcy filing in Delaware, the Herald reported 30 large creditors, 12 of which are employee retirement plans and unions. If those pension obligations are not assumed by a buyer, the federal Pension Benefit Guaranty Corp. would cover the pensions up to a certain amount. A 65-year-old retiree this year would max out at $64,432 a year in pension payments, according to PBGC spokesman Marc Hopkins. The Globe also is a creditor, owed $600,000 by the Herald, according to the bankruptcy filing. Rick Edmonds, an analyst at the Poynter Institute, a nonprofit that offers journalism training, said it is particularly difficult to be the No. 2 newspaper in today’s business climate. GateHouse, with its economies of scale, should be able to manage costs more efficiently than Purcell could do on his own, Edmonds said. The news of the deal, which broke late on Friday afternoon, had community leaders wondering about the fate of news coverage in Boston. Greg Torres, president of local think tank MassINC, said he remained hopeful that GateHouse could provide the necessary backing to keep the Herald going. “Competition in the media market is helpful for everybody,” Torres said. Beth Healy can be reached at beth.healy@globe.com. Todd Wallack of the Globe staff contributed to this report.